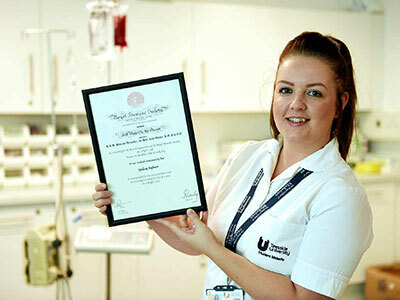 When a man collapsed in the street in Horden after suffering a single stab wound to the heart, Lyndsey Hepburn, a qualified nurse and current midwifery student at Teesside University, rushed to the scene. Lyndsey’s mum had been out running in the local area when she saw the situation unfold and hurried home to tell Lyndsey a man urgently needed help. Already at the scene were members of the public Lisa Jones and off-duty nurse Kelly Percival, who were carrying out CPR. They were then joined by PC Jason Pool and Lyndsey who kept the man’s airways open. The group managed to maintain the man’s pulse until an air ambulance arrived ten minutes later. A consultant then performed open heart surgery at the roadside, ultimately saving his life. He is now out of hospital and recovering at home. Lyndsey said: ‘It was the first time I had done CPR since I qualified as a nurse in 2016. It all happened so quickly that I didn’t really think, I just sprang into action. Along with Kelly, Lisa and PC Pool, Lyndsey was presented with a Royal Humane Society Award at a special event at Durham Constabulary headquarters in September. ‘As a nurse, it is just part of your job and you don’t necessarily expect to receive thanks. I was really overwhelmed and proud when I got the phone call to say that I was to receive an award,’ Lyndsey added. Lyndsey, a mum-of-four, is now studying PgDip Midwifery at Teesside University so that she move from adult nursing to midwifery.